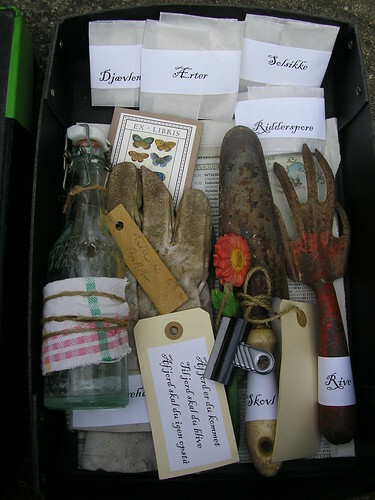 Tomorrow I send 3 brand new “practical handbooks” to an Artists´ Books exhibition in Sýningarsalur at Iceland. However, this is my “Handbook for Gardening at a Limited Space.” It’s made out of a black old, cardboard box filled with everything you need for turning a windowsill into a minor garden: A bunch of my newly invented paper jiffy pots, tools, seeds, even a bottle of water and a bag of mould – as well as directions for getting it all started. This entry was posted in Artists´Books. Bookmark the permalink. by “mould,” do you mean compost? or is it just mould. love that! it’s really something for all senses. great idea. I also like your newly invented paper pots.